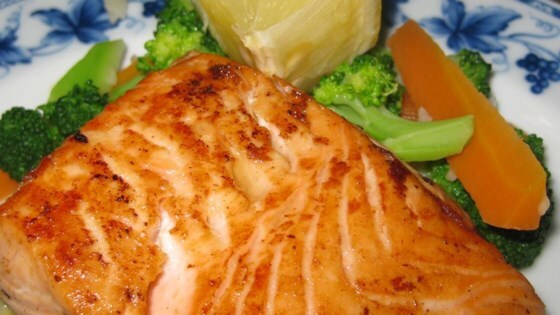 "The fresh lime juice and mustard add a nice tang to this moist and flaky grilled salmon. I came up with this marinade after tasting something similar at a friend's house and it is now one of our favorite ways to do fish. You may also use other firm fish steaks instead of salmon; halibut, tuna and swordfish all work well." This was a very disappointing marinade. Lime does not accentuate the flavor of salmon. We won't be making this again. Very good marinade, although I will marinade it longer next time and use more lime juice too. Thanks for the recipe! Very good, I should have marinated it longer than the hour, the lime flavor didn't come through quite enough for me but the spices were delicious!! Will make again! !